Directions for Use: Daily Conditioning - Apply a small amount to the palms of hands. Rub hands together and distribute evenly from roots to ends. Style as usual. Leave-In Treatment - After shampooing, apply a generous amount to the palms of hands. Rub hands together and distribute evenly from roots to ends. Reapply as needed and comb through for even distribution. Leave in to style and dry hair as usual. 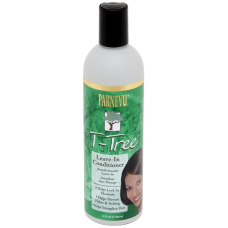 Excellent for natural, relaxed, pressed, curls, or color-treated hair. INGREDIENTS: Water (Aqua, Eau), Mineral oil (Paraffinum liquidum, Huile minerale), Cetearyl Alcohol, Behentrimonium Methosulfate, Stearalkonium Chloride, Cyclopentasiloxane, Melaleuca Alternifolia (Tea Tree) Leaf Oil, Menthol, Camphor, Fragrance (parfum), Citric acid, Phenoxyethanol, DMDM Hydatoin, Amyl Cinnamyl, Benzyl Benzoate, Benzyl Salicylate, Butylphenyl Methylpropional, Citral, Hexyl Cinnamaldehyde, Hydroxyisohexyl 3-Cyclohexene Carboxaldehyde, Limonene.